For over a quarter of a century, Cameron Hawley had two simultaneous successful careers—as a businessman and as a writer of short stories in magazines such as The Saturday Evening Post, McCall’s, and Good Housekeeping. For several years, he was an advertising executive in Minneapolis. This was followed by a 24-year career at Armstrong Cork Company in Lancaster, Pennsylvania, where he worked in marketing, product development, and product testing. He published his best-known business novel, Executive Suite (1952), a year after retiring from Armstrong. He wrote three more business dramas: Cash McCall (1955), The Lincoln Lords (1960), and The Hurricane Years (1969). 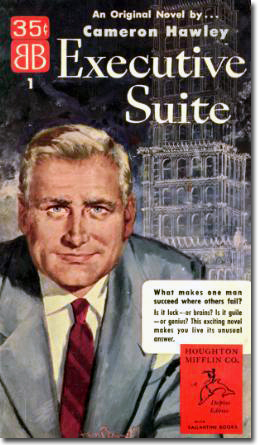 Cameron Hawley provides an honorable and favorable account of the majority of businessmen in his excellent, suspenseful, and engaging 1952 novel, Executive Suite. A 1954 film adaptation of the book stays rather close to the novel but is a bit more negative in its depiction of people in business. Both the novel and film remind one of an Ayn Rand novel. Overall, both versions provide a realistic and positive image of the businessman, and show the actual machinations and politics of corporate life. They communicate the drama and romance of business, and make excellent business school case studies. The story begins with Avery Bullard, president of Tredway Corporation, in New York to determine if an outside person would be right for the vacant position of executive vice-president. Bullard was 56 years old in the novel but only 53 in the film. He had just met with Bruce Pilcher and Julius Stiegel, respectively president and chairman of the board of Odessa Stores, to discuss this position. Bullard had lacked sufficient foresight to create a succession plan and to select an executive vice-president soon after the death of the former executive vice-president, John Fitzgerald. Many months had gone by without appropriate actions being taken. It had taken pressure from investment fund executives for Bullard to give the matter some serious attention. He had been too busy building the company to give consideration to who was going to run it after he had retired. After meeting with Pilcher and Stiegel, Bullard wires his loyal and professional secretary, Erica Martin, in Millburgh, Pennsylvania and asks her to call an executive meeting for six o’clock that evening. Bullard had decided to present a new business proposition at this meeting to see how his various vice-presidents reacted to it. Based on their respective performances, he was going to select one of them to be his executive vice-president. The efficient Erica Martin notifies the executives of the last-minute meeting. Perceptive of office politics, she adeptly handles the dilemma of the order in which to inform the executives of this meeting. As Bullard hails a taxi, a catastrophe occurs—he suffers a cerebral hemorrhage just outside of Pilcher’s building. Bullard is not identified immediately because his wallet has been picked up by a passerby who took the cash it held and discarded it. All that is known to the authorities is that there is a John Doe with the initials A.B. In the film version, it is George Caswell, Tredway board member and head of a stock brokerage house, who witnesses Bullard’s death. He decides to sell Tredway Stock short with the intention of repurchasing it at a lower price after Bullard’s demise becomes publicly known. The success of Caswell’s scheme depends upon Bullard’s passing being announced after Caswell borrows and sells Tredway shares but before the news of Tredway’s strong quarterly earnings report (of which he is aware) is announced to the public. The use of such knowledge is indicative of insider trading. Only then could he buy back and replace the borrowed stock at a price lower than the one at which he had sold it. It is interesting to note that in the movie it is Bruce Pilcher, rather than Caswell, who first sees Bullard’s dead body and who schemes to sell Tredway stock short. Pilcher, a candidate from a competing company whom Bullard has been considering for the executive vice-president position, is severely chastised by his colleague, Julius Stiegel, for this devious stock scheme. At the six o’clock meeting, no one knows yet that Bullard is dead. In the film, it is Caswell who phones a number of hospitals and eventually finds a short article in the Friday evening paper about a John Doe with the initials A.B. in the morgue. Caswell then phones the police and informs them that Avery Bullard is the unidentified man in the morgue. However, in the novel, the woman who picks up Bullard’s wallet feels guilty and calls the police after she reads the small piece in the paper. Either way, news of Bullard’s death spreads as the evening goes on. With the death of the king and the lack of a successor in place, the story shifts to the jockeying that takes place among five executives vying for the throne: Loren P. Shaw, V.P. and Comptroller; Frederick W. Alderson, V.P. and Treasurer; Don Walling, V.P. of Design and Development; Jesse Grimm, V.P. of Manufacturing; and J. Walter Dudley, V.P. of Sales. Loren P. Shaw, vice president and comptroller, takes the lead to establish his power immediately after finding out about Bullard’s passing. He takes it upon himself to release positive financial information to the press and to set a date and time for Bullard’s funeral. Shaw’s quick thinking keeps Tredway stock from declining. Because the company has until Monday, quarterly financial reports are sent out in Saturday’s newspapers thus ensuring that Tredway’s stock price will not fall. Shaw’s immediate action gains favor throughout the company as well as with customers and suppliers. Alderson and Walling are proactive but not as much as Shaw is. When they arrive at Tredway Tower, they are surprised to find that Shaw has already released a statement to the press and the financial statements for the last quarter so that the stockholders will not lose faith with the death of Bullard and sell their stock. Shaw’s plan works and, as a result, Caswell (in the film) is unable to repurchase the stock that he has sold short. When Alderson and Walling arrive to find Shaw making such decisions without consulting the rest of the board, Alderson is infuriated because he knows that Shaw disrespected Bullard. Alderson and Walling are in agreement in not wanting Shaw to be president. Shaw is a planner and is excellent in the areas of cost control, finance, budgeting, and so on. He seems to have an answer for almost every situation. He is concerned with the company’s profits and with satisfying stockholders. He is not concerned with the quality of the products, though, and argues that low-priced merchandise has an important place in Tredway’s profit structure. Shaw is also unimaginative and not particularly concerned with the morale of the plant employees. He lacks long-term vision and does not see the big picture for the company. Alderson and Walling blame Shaw, the efficiency expert, for making Bullard recently lose sight of the Tredway tradition of quality products. Shaw is a skilled, calculating, ambitious, and politically-astute businessman who is relentless in his efforts to climb the corporate ladder. In the film he is depicted as a ruthless and manipulative schemer who blackmails Caswell and Dudley. Shaw makes a deal with Caswell that if Shaw is elected, then Caswell will get back the Tredway shares he sold short at the price at which he had sold them. In addition, having spied on Dudley, Shaw catches him in an affair and blackmails Dudley for his vote. In the novel, there is no reason to blackmail Caswell, and Shaw merely contemplates blackmailing Dudley for his vote. Walling initially champions Alderson, Bullard’s right-hand man for a great many years, for President. Alderson has the most tenure of the various vice-presidents but he does not believe that he would be able to defeat Shaw. Although he has the background, he does not think that he is the right fit to be president, nor does he think that he has the passion and drive to succeed as president. He also firmly believes that he is incapable of performing the job as well as Bullard had done. He thinks that a younger man should take over. Before Avery Bullard was president of Tredway, Oliver Tredway had been the head man. He had built a large corporate office building, Tredway Tower, in Millburgh, Pennsylvania, a small city where Tredway was the major employer. Its carillon rang loudest in its executive suite. Bullard took over as president after Oliver Tredway committed suicide because of impending financial disaster. After Bullard assumed the presidency, the people of Millburgh looked at the tower with admiration and respect. In Millburgh, everything seemed to center around Tredway Tower, the tallest building in town. Avery Bullard began at Tredway as a salesperson but he also became a designer and a production specialist. He was an insightful man of superlative talent and keen business sense who had a commanding presence and the loyalty, admiration, and respect of his employees. Luigi, the elevator operator and Bullard’s best friend, idolized him, as did his executive secretary, Erica Martin, as well as most of the vice-presidents. All of the vice-presidents were affected by him as he was personally involved in each of their areas. As a hands-on president, he desired what was best for each of his vice-presidents. Bullard had assembled a team of executives by capitalizing on their individual strengths and by keeping each vice-president focused on his own special area. He was a one-man-show who did not share his views and thoughts with the entire executive committee. Although each executive knew about his particular areas and what Bullard wanted from him, there was no brainstorming among the executive team members. The executive committee was not a team. Each vice-president wanted Bullard’s approval but was not concerned with what the other VPs thought of their performance. Bullard had selected vice-presidents who had strengths and abilities in their specialties. He, on the other hand, as president, had to have knowledge of and make decisions regarding all aspects of the business. Although Bullard was highly intelligent, charismatic, and had a powerful personality, he could perhaps also be seen as manipulative. A master of psychology, he knew each of his VP’s talents, ambitions, motivations, desires, and personalities so as to be able to predict their reactions and behaviors and, at times, to play them off against one another. Most of the time, however, he simply kept each VP focused on his area of specialization. Bullard, as the “one man” in the operation, valued building the business more than he valued personal relationships, marriage, family, etc. His affair with Julia Tredway, daughter of Orrin Tredway, had ended badly as Bullard could not balance the challenges of work life and personal life. Julia had broken down after her father’s suicide. She is now embittered because Bullard loved the company more than he loved her. "Cameron Hawley provides an honorable and favorable account of the majority of businessmen in his excellent, suspenseful, and engaging 1952 novel, Executive Suite. A 1954 film adaptation of the book stays rather close to the novel but is a bit more negative in its depiction of people in business." Despite his immense intelligence, Bullard overlooked the importance of having a corporate succession plan. If a succession plan had existed, then we would have had a very different story or perhaps no story at all. Bullard thought he would be with the company for nine more years. If he had named a successor or had a succession plan, he would have, in a sense, been able to exert some control over what happened to Tredway even after his demise. Alderson and Walling had noticed a recent progressive weakening of Bullard’s drive for constant improvement. He recently lost his way and was losing ground to the competition by producing a low quality line of furniture compared to that which was previously produced. At first, Don Walling wants to support Alderson for president but Alderson declines. Walling, a family man, initially considers himself to be too young for that position. As an engineer, he is more interested in developing new ideas, manufacturing processes, and innovative products. Alderson and Walling then turn to production man Jesse Grimm, one of Bullard’s favorites, but they learn that he intends to retire soon. Grimm had decided to retire prior to Bullard’s death and had planned on announcing it the following week at a board meeting. Alderson and Walling select Grimm because Alderson believed that Dudley and Caswell would choose Shaw due to their business relationships and friendships. Grimm, who considers himself to be a “real production man,” was ready to take early retirement and hates Walling, the young production man and “boy wonder,” for trying to be like Bullard. He tells Alderson that he will vote for anyone Alderson recommends except Walling. When Grimm had originally built his factory in Millburgh, he had been worried that Bullard would permit Walling to interfere. What happened was that Bullard detained Walling in Pittsburgh and Grimm was left free to build the factory his way. Recently, Grimm took delight when Walling’s experiments failed. Walling attributes his failed experiments to the absence of proper equipment that was a consequence of Shaw’s cost-cutting measures. J. Walter Dudley, the affable and social sales and people person, knows how to entertain and is the most-liked executive in the firm. He is cheating on his wife and is not a serious candidate for president. Even if he were, at least in the film version, he is being blackmailed for his vote by Shaw who catches Dudley having the affair when he was supposed to be on a business trip to Chicago. In the film, Shaw informs Dudley that nothing will be mentioned if he supports Shaw for the top job. Walling, as mentioned, is initially uninterested in gaining the presidency. In addition, Walling’s wife, Mary, resented Bullard’s influence over her husband and wanted him to leave the company. Walling does not want to work for Shaw, and comes to realize that only he, himself, has the pride and passion to run the company. His wife tries to talk him out of vying for the presidency and urges him to strike out on his own. Walling explains to his wife Shaw’s focus on cost-cutting and the bottom line at the expense of the company’s quality, innovation, and creativity. Walling tells her that his new process finally works but that it cannot be implemented because of a budgetary directive issued by Shaw. Throughout his career, Walling had kept a balance between work life and family life and had toiled alongside the plant workers. He takes pride in his work and is concerned about the well-being of the employees. He listens to the factory workers who are dissatisfied with the quality of the products they are producing. He knows of long-time factory employees who refuse to work on Tredway’s low-quality furniture line and take a pay cut to avoid working on that line. He knows that people are motivated by pride in their accomplishments and not solely by money. He wants all of Tredway’s employees to take pride in selling quality products to loyal customers and to stand behind these products. Walling wants the company to reinvest profits to develop quality products that elicit the pride of the employees. He wants to relive his earliest experiences with the company by building the best possible products. This approach will benefit customers, employees, and shareholders alike. Walling realizes that the key to victory is the vote of board member Julia Tredway. He approaches her to seek her support by convincing her that he is the right man for the job. The unstable Julia does not seem to care about money, stock, or the future of a company that has torn her life apart and has caused her so much sadness. Walling’s plea convinces Julia to support him in the novel but not in the film version. Unfortunately, in the film version, she has already given her proxy to Shaw, thus empowering him to vote her shares at the board meeting. Shaw’s fatherly sympathy easily persuades the fragile and emotional Julia, who is devastated by the death of Bullard. Just before the meeting, though, angry and grieving, Julia changes her mind, tears up the document she had given to Shaw, and goes to the meeting in the executive suite to vote her shares for herself. In the film, Alderson phones Walling’s wife and asks her to let Walling know that he has been detained while picking up Grimm at the train station and wants to have the vote postponed until the two of them arrive. She nearly sabotages her husband’s chances by not giving him the message, but feeling guilty, she later goes to the executive suite to support her husband’s desire to be president and to ask him to forgive her. Shaw begins the meeting without all of the board members present because he fears that they may have plotted against him, just as he has plotted against the others. Dudley nominates Shaw and the first ballot is inconclusive because one member has abstained. The first vote leaves Shaw one vote short because Caswell (not Julia) has abstained. In the film, Alderson and Grimm arrive in time to hear Walling’s passionate and motivational oration. In the novel, Alderson uses the drive time to clear up a misunderstanding that Grimm had about Walling. Walling is a dynamic character who has changed and developed into a creative, charismatic, strong, decisive, and visionary leader with a future-orientation, much like Bullard had been. Walling’s impassioned speech applauds high quality production, recognizes the importance of employees, and promises to grow the company. He says that men do not work for money alone. They require work they can take pride in. He speaks of Bullard and of how he had changed over time. He says that the pride of one man is not enough to run a company. He believes that Tredway is currently sacrificing quality and failing to take pride in its products. He wants to get back into the business of building quality furniture. He says that the plant workers want to do their best and to take pride in their work. Men have to take pride in what they are doing. In the film version, he shows his dissatisfaction with the low-cost KF line by picking up a table and breaking it, thus making a compelling argument against producing sub-par products. He argues that the company should not compromise the furniture’s beauty, function, and value. He observes that Grimm wants to take pride in craftsmanship and that Dudley wants a quality product to sell. He wants to bring the company back to its former greatness. Walling’s speech wins the hearts and minds of all of the board members, including Shaw. Walling chooses Shaw to be his executive vice-president and to help him keep his feet on the ground. Both Walling and Shaw are right and they need one another. The company can both have a quality product and produce it in a cost-effective manner. Walling and Shaw shake hands and become working partners with each bringing his specific strengths and perspectives to the boardroom. Until the company’s succession crisis, Tredway’s executive group had never acted as an effective team. Because there was no executive vice-president to take charge, they were forced to come together and ultimately to work as a team. The idea of the importance of time constraints, pressures, and deadlines in business permeates Executive Suite from beginning to end. The film begins with the ominous ringing of the chimes in Tredway Tower above the streets of Millburgh, Pennsylvania. Perhaps they were tolling for Bullard who was experiencing his last moments of life on earth. In the novel, the date and time are given, thus counting down the last minutes of Avery Bullard’s life and leadership of his company. The short-selling of Tredway stock depended upon the timing of its sale and repurchase. When Shaw immediately takes the reins and quickly issues favorable financial information, the stock price does not go down. There also is great time pressure to find a successor for Bullard. The film version ends as it had begun, with the ringing of the chimes of the bells of Tredway Tower. This time, however, the ringing was hopeful, looking forward to a great future for the company.